Last fall – ages ago! - we talked about blocking. Since then my husband and I have uprooted ourselves from Norway to my family home in the mountains of western North Carolina and have been settling in, adjusting to the climate and acquiring several chickens, two alpacas, a vegetable garden and a dog. But the squash, beans and corn have all finally – thankfully - stopped producing, so here’s the much delayed continuation – blocking part 2. 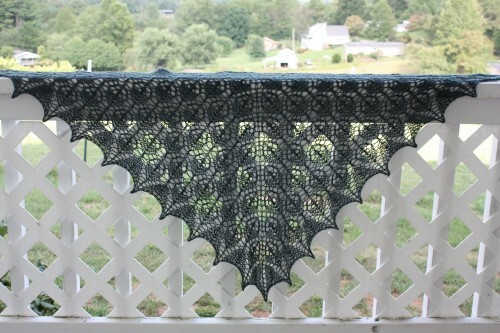 This time we’ll focus on blocking lace. First let me just remind you of the most important thing before we start: blocking a knitted garment requires some type of moisture - water or steam. Be sure the yarn used in your project will tolerate the treatment you’re about to put it through! If your knitting does not tolerate being submerged in water, you can also pin out while spritzing with a spray bottle or place a damp towel over the pinned out piece and let dry. 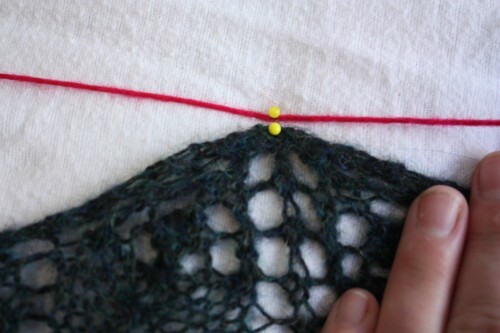 Using the steam setting on your iron – as described in Blocking, Part 1 is another way to block the knitting into shape. Again, be sure to check the yarn label or test on a swatch to decide which method is appropriate for the yarn you’ve used! 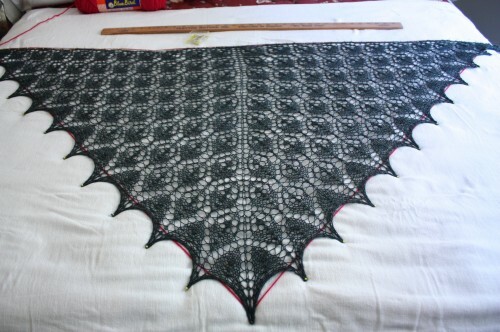 The points on the edge of the shawl have lost their pointiness and the whole thing is looking a bit sad. Then I took the shawl to the extra bedroom, removed the comforter and placed a clean sheet directly on the mattress. If you don’t have an extra bed, you can put a clean sheet on a carpeted floor or a special blocking board. You can even make a blocking board yourself, if you’re feeling handy. Although I haven’t tried it myself, I’m sure those interlocking foam mats would also work well and be easy to store when they’re not in use. Wherever you decide to block, be sure you can keep your pets locked out – cats have a particular affinity for snoozing on slightly damp wool. 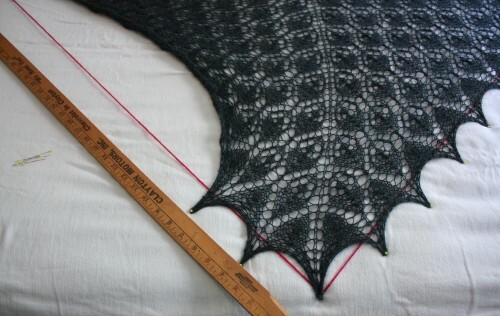 If you block on your own bed, start early enough in the day that the knitting will be sure to dry before bedtime – a dry day and a fan can help speed up the process. And if you happen to sleep with someone else, be SURE to get all the pins out of the mattress when you’re through. I cannot stress this enough, people. 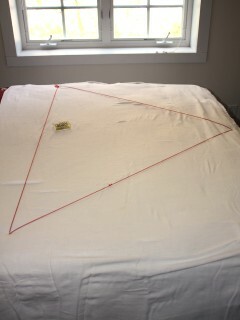 Next I stuck three straight pins through the sheet into the mattress and attached spare yarn to each point - measuring to make sure I had a nice isosceles triangle. 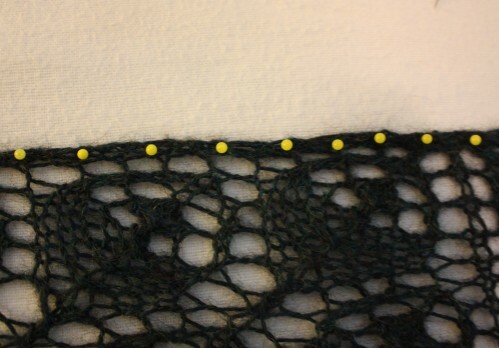 I use 1 ¾ inch rustproof pins that have a brightly colored plastic ball on the end – extra long so they are securely anchored in the blocking surface, rustproof since they’re being used in damp yarn, brightly colored to make them easier to see when I’m removing them and with a ball on the end to help keep the knitting from sliding off. I also marked the center of the top edge of the shape with an extra pin. For other shapes follow the finished measurements or schematic provided with your knitting pattern. Marking an outline like this is not necessary but makes it much easier to keep from pinning your knitting out to a wonky shape and having to start over. Continue to insert pins at even intervals from the center outwards through the knitting and into the mattress (or carpet / blocking board – whatever you happen to be using). 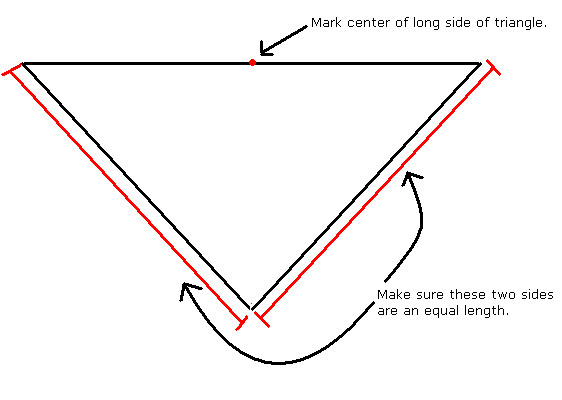 If the knitting has defined points along the edges, measure an equal distance between them. 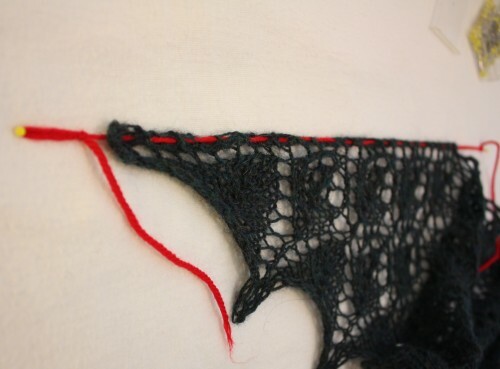 You can also use special blocking wires to insert through the straight edges of your lace if you happen to have them. If your yarn does not tolerate being submerged in water, you can also pin out while spritzing with a spray bottle or place a damp towel over the pinned out piece and let dry. Using the steam setting on your iron – as described in Part 1 – is another way to block the knitting into shape. Again, be sure to check the yarn label to decide which method is appropriate for the yarn you’ve used! After the knitting is completely dry, remove the pins (be sure to get them all!) and voila! 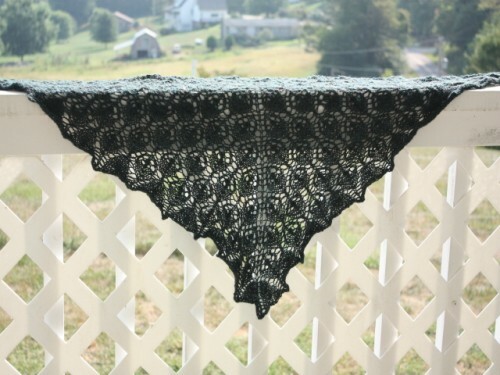 A prettier – and usually a good deal larger – lace shawl! 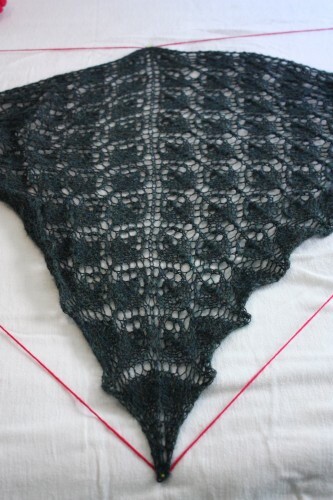 Blocking – while it may take some time – makes such a difference in the finished product. Theresa is back in the US. © 2011 Theresa Vinson Stenersen. Contact Theresa.